As an audio engineer, I love a solid Plan A, and have learned over time the importance of backing myself up with an equally solid Plan B (and if my instincts are telling me to develop a Plan C, I’ll do that, too). 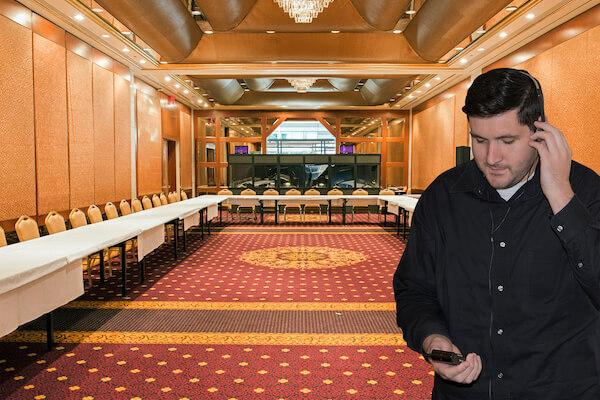 In my role as Account Manager at Conference Rental’s facilities in New York, N.Y., I oversee all aspects of language interpretation events from project planning to delivery. The range of events we do is broad, from moderately sized corporate meetings involving anywhere from 50 to 150 participants, to high-level talks at international congresses, with hundreds of political leaders in attendance. Depending on the scope of the event––and the number of languages being spoken––my job is to provide simultaneous interpreters with the technical systems and support required in order for them to be able to do their job. It’s a great gig, and recently, I thought it would be fun to catalog an average day in the life of a conference technician, which requires a lot of preparation, some resourcefulness, and a good deal of diplomacy. 5:43-5:58 am: I greet the driver outside of our office with a smile (and, more importantly, a cup of coffee). After several trips to and from the freight elevator of our warehouse, we’re all packed up and ready to head to the venue. Right now, the bulk of the events we support happen in hotels. The event planner will book a meeting space at a hotel, at which point the hotel or the event planner will book the language service provider, who assigns an interpreter to the event. If the language service provider doesn’t own their own language interpretation equipment––which is usually the case––they will rent the gear through us. We also work with many hotels’ in-house audiovisual organizations; sometimes they’re the ones who contact us directly to set up the equipment rental. 6:11 am-6:14 am: Seeing as it’s a Monday morning at one of the largest hotels in the city, there are a slew of other vendors preparing to load-in. As the truck backs in, I realize that the dock is at least a foot taller than the back of the truck. Time to play the charm card! As the job title suggests, a conference technician must be technologically competent, but that’s only part of the job. Arguably the most important part of our job is managing logistics: how we’re going to get the equipment to the venue, the load-in time, if there is a safe place to store our equipment cases when they’re not in use, and then the particulars of the venue itself. To manage these logistics to the best of our ability, we try to get as much information as ahead of time. (This isn’t always completely possible, but it definitely makes for a smoother event––not just for us, but for everyone involved, from the client, to the language interpreters, to the other trades straight on down to, believe it or not, the caterer.). Every detail you can possibly think of, no matter how nit-picky, will be useful to us. 6:20 am: Once inside, I quickly realize that the majestic appeal of a historic hotel doesn’t necessarily apply to its elevators. Squeezing in a 400-pound, 80-inch equipment case plus a human body is going to require some serious geometry skills. And yes: one of the nit-picky items we need to know in advance is the facility’s freight elevator capacity. When full-sized interpreter booths are involved––because remember, when you factor in the cases that we use to transport them, they weigh about 400 pounds––we really must know the path we’re going to follow to get them into the building, then into the elevator, and then into the room. One of the biggest challenges we face, especially in older facilities, is whether or not the freight elevator is large enough to hold this stuff. 7:10 am: Setup is looking great: the booth is up, radiators are powered on and receivers are ready for distribution. Then the catering manager arrives. “That location is not going to work for getting our servers in and out of here comfortably,” he informs me, gesturing to the booth. Once again, I’m in debt to the extra hands on site. The heart of our systems are the booths. This is where the interpreters will spend their day. In most cases, it’s one booth per language: for example, if English, French, Spanish, and German are being spoken, then we will set up four separate booths. If it’s a larger event, typically our clients will request fully enclosed, soundproof booths. We can also provide semi-enclosed tabletop booths for smaller events. Then there are the interpreter consoles outfitted with the gooseneck microphones that the interpreters speak into, and the headset receivers that the event attendees wear to listen to the interpreted speech. The audio signals are fed through infrared (IR) radiators, which are big, rectangular, tripod-mounted units that we set up throughout the room. The number of radiators required depends on the configuration of the space itself. 7:23 am-7:30 am: After receiving the XLR line level feed from the AV crew and routing it through our transmitter, it’s time to test room coverage. With one of the AV techs telling jokes into the interpreter console, I pace every inch of the room wearing a receiver to ensure signal coverage. 7:30 am: Encountered two dead spots. Not a big problem, since we came over-prepared. One more IR radiator added to the chain and a few slight adjustments later . . . and we’re in business. This is a prime example of how valuable it is for us to have information on the room layout and its dimensions prior to the event. These IR systems rely on the signal bouncing off the walls, so if the ceiling is too high, or if the room is super-wide, we’re going to need to bring in extra radiators. 8:03 am: The interpreters arrive. One of them seems to be quite familiar with our interpreter consoles, the other not so much. This has never been a problem for me, since it’s not difficult to learn how to use our systems. The units themselves consist of an on/off mic button, a cough/mute button, and then buttons for what channel the interpreter is listening to and what channel they’re transmitting out to. Ninety-five percent of the time, all the interpreter needs to know is where the on/of button for the mic is, and where the mute button is. In any case, all interpreters that I have worked with are very professionals. They show up ahead of time––not last minute––and they come prepared, they know what they’re doing, they’re usually familiar with the gear, and if they’re not, they ask the right questions. 9:00 am: The meeting has officially begun. No matter how many events I do or how well the tests go, there’s always that first minute of anxiety: is anything catastrophic going to happen? 9:21 am: Twenty minutes in. The first interpreter is a bit loud, but nothing a slight audio balance won’t fix. When we’re hiring technicians for these events, we look for somebody who has a background in audio because we need people who are technically adept. But they must also have strong interpersonal skills––it’s just as important as the technical side of it, if not more. These events almost always involve someone high-profile, like a CEO or a high-level political figure. Understandably, they want everything to be perfect, and therefore, they are going to be demanding. You have to be patient, you have to know how to communicate, and you have to be willing to deal with things that come up, on the spot––whether it’s a technical issue, a logistical issue, or pretty much anything else. And, at least for me, this is part of what makes this job so interesting. 3:15 pm: After a few closing remarks, it’s a wrap! 3:44 pm: There’s a cocktail reception immediately following the close of this meeting––not the first time I’ve had to strike an event on tip-toes! 4:38 pm-4:51 pm: Time to play Tetris with the elevator again. With some help, the gear is successfully back onto the truck. 5:06 pm: As I go in to make one final sweep for gear, I get stopped by the (now slightly inebriated) client. Nothing but positive feedback all-around. Language interpretation events can’t exactly be classified as “showbiz,” but there’s definitely an element of showbiz involved, and the post-event comedown is as rewarding as the pre-event lead-up is exciting. Being a part of these events––especially those like the G20 Summit we’ve been involved with––is really interesting. And it’s even more exciting because now Conference Rental has an office in New York, and I get to be a part of establishing the company here. Sure, sometimes that means that part of my job involves stopping rush hour traffic in Manhattan to help our driver load into a venue, but hey, how many people can say they’ve stopped traffic in the Big Apple?